Drawing examples from mathematics, physics, chemistry, biology, engineering, economics, medicine, politics, and sports, this book illustrates how nonlinear dynamics plays a vital role in our world. Examples cover a wide range from the spread and possible control of communicable diseases, to the lack of predictability in long-range weather forecasting, to competition between political groups and nations. 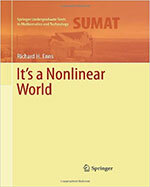 After an introductory chapter that explores what it means to be nonlinear, the remainder of Part I covers nonlinear diagnostic tools such as fixed points, limit cycles, fractals, chaos, bifurcations, and solitons, and nonlinear diagnostic tools such as fixed point analysis, bifurcation diagrams, and Lyapunov exponents, to name a few. Part II of the text presents illustrative examples of nonlinear dynamics that are highly relevant to the contemporary world. Numerous computer simulations and exercises allow students to explore topics in greater depth using the computer algebra system Maple. The mathematical level of the text assumes good working knowledge of basic calculus and prior exposure to ordinary differential equations and the wave and diffusion equations. No prior knowledge of Maple is assumed. The book may be used at the undergraduate or graduate level to prepare science and engineering students for problems in the "real world" or for self-study by practicing scientists and engineers. The more casual reader can simply read the book for intellectual enjoyment.